If you're reading this chances are you searched for a Google Adwords course for your Shopify/Ecommerce store because you want an alternate to Facebook. Let's face it, Facebook advertising is great, but it's starting to get expensive. To succeed in Ecom, you need targeted traffic. Google is the original master of targeted traffic and has been around a lot longer than Facebook. Savvy ecom marketers are now exploiting the benefits of using Google Shopping ads to full effect. If you're looking to either ditch your Facebook ads and try something new, or supplement them with a different type of traffic, I have some top suggestions for you on what Google Adwords courses are the best for ecom right now. Probably the best Google Ads course for ecom right now, is Google Ads Ecom Academy. With 9 modules and growing, it's the most complete course on Google Shopping for ecom/drop shipping that I have seen. I reviewed this course and you'll get to see what it looks like inside as well as a detailed description. 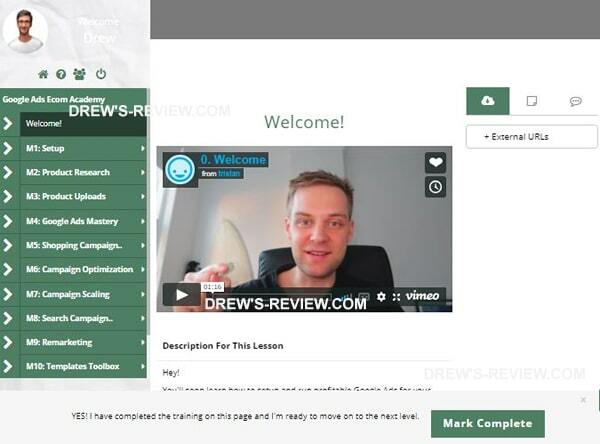 Read my review here or go ahead and take a look at Google Ads Ecom Academy. I'm a huge fan of Franklin Hatchett and you'll notice a common theme on my blog that I recommend it over many other ecom courses. There's a reason for that - his teaching and strategies are that good. However compared to Tristan's course, Ecom Elites focuses on everything you need to get started in drop shipping (newb friendly) including a module in Google Ads. It's not a complete course dedicated to Google ads, but you'll learn plenty enough to get started. So if you're looking for an all in one solution, this course is it. Check out my review here or see more on Ecom Elites by following this link. Rounding out as my third choice is Shopify Ninja Masterclass. There's a couple of reasons for this - price and content. Priceswise, you're getting more value with either Tristan's or Franklin's course. In regards to content, there is some Google Ads training but it is not as comprehensive as Tristan's or even Franklin's course. You can read my review on Shopify Ninja Masterclass or visit the course page here. I hope you found this page useful in your search for more information on Google Ads for Ecom. I suspect many new courses are going to pop up in the meantime, which means more competition in every aspect. If you're thinking of getting into Google Ads, now is a great time!